Oh how to be polite and nice. It all comes down to being kind. Parents, pets and little brothers. So begins a charming spin-off of the original Madeline book by Ludwig Bemelmans. 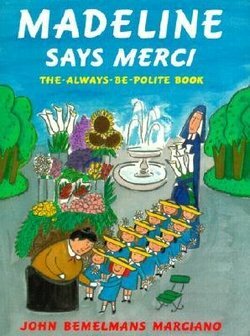 Children won't mind learning to say "please and thank you" from Madeline and her friends. This clever etiquette handbook helps children understand how to behave in a variety of social situations--from how to greet the Queen to how to properly express gratitude for a gift. Both boys and girls can relate to the rambunctious Madeline and will enjoy the lively prose and witty illustrations. This is a wonderful addition to your home library that will bear reading and re-reading as your children grow and encounter new people and experiences. After reading Madeline Says Merci, encourage your children to put their good manners into action. Set up a special snack-time tea party for practicing table manners. Reinforce reading and writing skills by having older children write thank you notes when they receive gifts. Get theatrical and have your children act out some of the scenes from the book. There are a myriad of ways to reinforce good etiquette and this book helps make it fun! For an entire reading list of books about cultivating good manners, check out the recommended reads at Children's Books Guide including my personal favorite Dude, That's Rude.